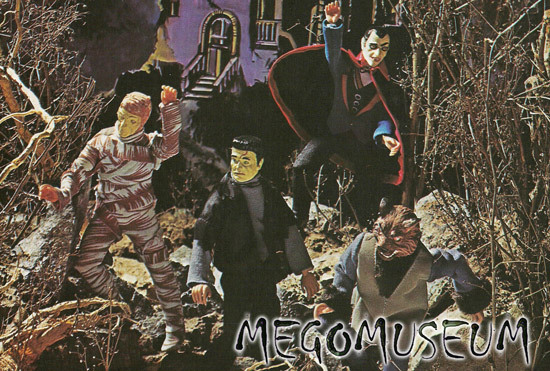 There were several Monster lines in production in the Seventies, and Mego's popular collection is featured here. 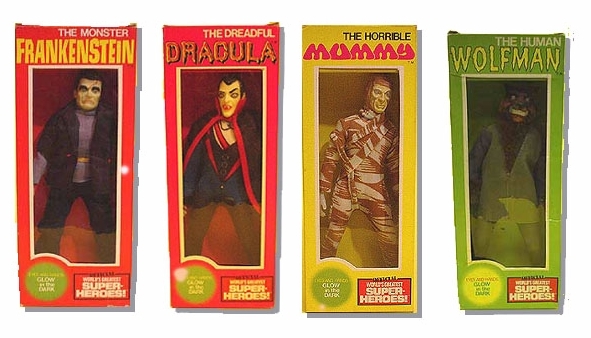 Monsters came in Solid and window boxes, as well as Kresge cards. They were re-released in 1980 under the Lion Rock name. The eyes and well-sculpted hands GLOW IN THE DARK! 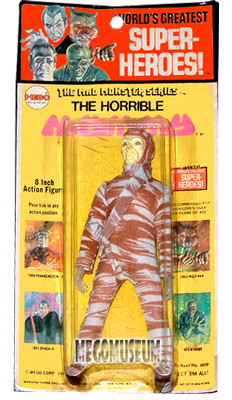 If you are into Monster Toys or want to get turned onto them, please visit Ray Castille's The Gallery of Monster Toys. Thanks to Robert Levy for lending his Monsters for scanning. Digital illustration above by Scott Carroll. 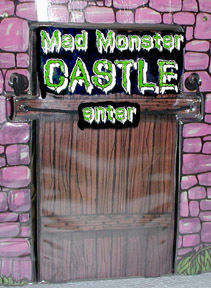 Dare to enter the Mad Monster Castle Playset ? Above is a rare shot of the Mego Mad Monsters Prototypes from the Baravelli Catalog. Note that the figures don't yet have their glow in the dark hands and Frankensteins "flat top" suggests that the blue haired version was in fact a cover up to an early error. Here's two weird variations, Red Haired Drac and Blue Haired Frankie! Both are very rare.Drac courtesy of Vince. Their origins stymie most collectors, the best theory heard thus far is that the first figures resembled the Universal make up too closely (ie Frankenstein's flat top) So Mego quickly added an odd paint combination until the head sculpts could be altered. 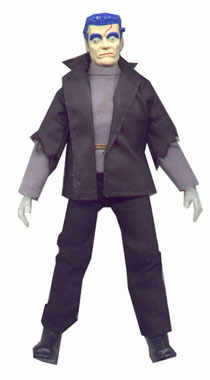 When asked about this Mego VP Neal Kublan stated that Mego wouldn't have knowingly produced a flat top for Frankenstein, which lends credibility to the notion this was a quickly corrected factory error. This is one of my favorite Mego pictures of all time. Courtesy Brian Heiler. it is from a Montgomery Ward's Xmas Catalog and features the WGSH slugging it out with the line of Monsters from Lincoln. They made more Monsters, but the quality just isn't there. How could it be? They weren't Mego... For more information on Lincoln and AHI Monsters, click the link at the bottom of the page. 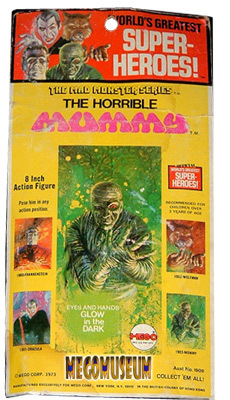 The artwork on the Monster boxes is among Mego's finest. Look for more examples as soon as they come. This shot is of the early versions of Dracula and Frankenstein. Not Dracula's smooth hair and Frankenstein's flat top. 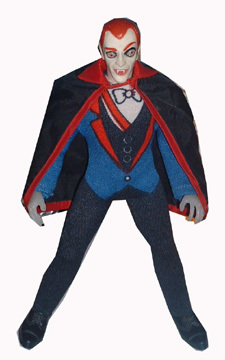 Mego quickly corrected the mistake and painted the remainder of these figures heads Red (for Dracula) and Blue (For Frankie). 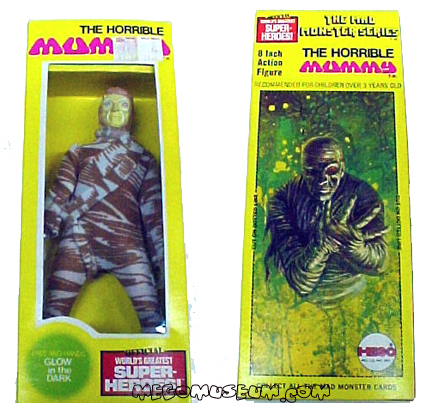 Kresge Carded Monsters (such as the Mummy shown above) are extremely hard to find, very few complete sets exist making them very desirable. Monster Window Boxes are also extremely hard to find, what you are looking at is one of the very few complete sets. 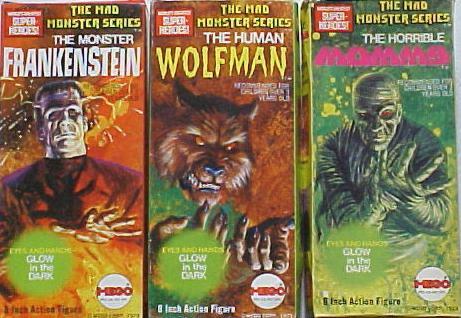 With the recent discovery that the Western Boxes were drawn by legendary artist Gray Morrow many collectors believe the Mad Monster packaging is another bit of undiscovered Morrow art as it resembles many of the posters Morrow did for Independent International films such as "Dracula Vs Frankenstein"